The Swiss government has officially conveyed to the Pakistani Law Ministry that the money laundering cases against President Asif Ali Zardari and others could not be reopened. 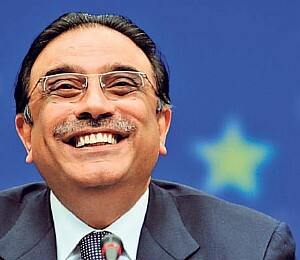 In response to a letter written to Swiss authorities by former law minister Farooq H Naik, the Swiss authorities told the Law Ministry here that cases against President Asif Ali Zardari and others could not be reopened as the cases were time barred and the time had lapsed. Following the Supreme Court’s ruling in the NRO implementation case, then law minister had written a letter to the Swiss authorities to inquire about the legal status of the money laundering cases against the president. The said cases were closed in 2008 on the request of then Pakistani attorney general Malik Qayoom. But, later, on the directions of the Supreme Court, the PPP government after a serious confrontation with the court, had written to the Swiss authorities. Sources in the Law Ministry said a sealed envelop carrying the official version of the Swiss authorities was received the other day, which was opened on Tuesday by Law Minister Zahid Hamid. Naik, during his tenure as law minister, had claimed that the Swiss authorities had dropped the cases against president according to their own laws, and not in accordance with the immunity given to the president under Pakistani laws. I wonder how much did the cheap justice make out of this deal? The Supreme Court is to be blamed 100% for this. They dragged this case on long enough that the statue of limitations would run out. It was all over the papers that time is running out for this case but SC kept putting it off. I am sure the judges knew how to make some money from zardari and still come out as hereos to the public. Pity on poor Pakistani nation for their ignorance and stupidity. These judges have made a complete fool of the nation and yet Pakistanis regard them as heroes. One of the biggest crooks in this Judges' Cabal/Mafia is the"honorable", "God-fearing" Justice Khalil-ur-Rehman Ramday who is set to make a killing in coming days. He has been suppressing all cases of fraud against Mansha (you didn't think Mansha made his fortune honestly, do you?) for over 20 years. With his partner Nawaz back as PM and his other partner Kh. Asif as Bijli Minister, they are all set to makea killing…….with Ramday providing protection from prosecution…..
One should be corrupt to get a "big chair" in Pakistan. You guys are naïve. There is no money in the Swiss banks. The whole drama is farce. See his pic atop,he laughed all the way to the bank. The beautifull building next to Parliament is occupied by the ugly creature. They did not study the Swiss verdict properly, or perhaps failed to understand it despite repeated esplanations by the bar. OR understood it, but dragged the case intentionally for cheap popularity. They should be made to pay for the millions wasted dollars. P.S. : They should learn a lesson in the case of Hussain Haqqani, where laws of another foreign land are to be considerd. But they wwon't.